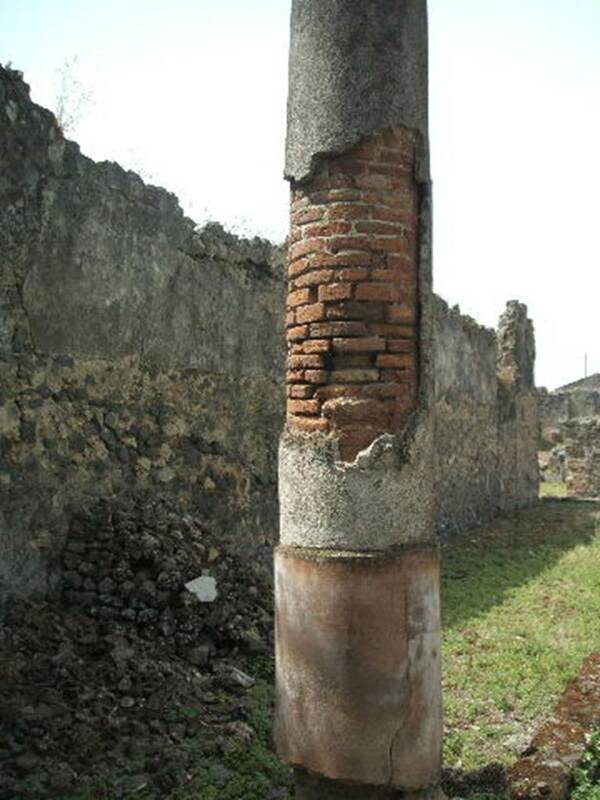 IX.6.5 Pompeii. 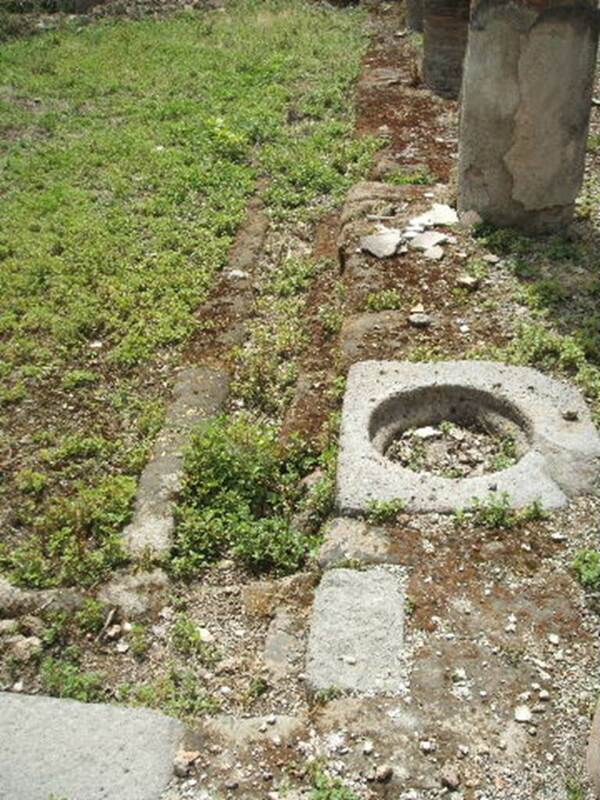 House of Oppius Gratus. Linked to IX.6.4, IX.6.6 and IX.6.7. Excavated 1878. 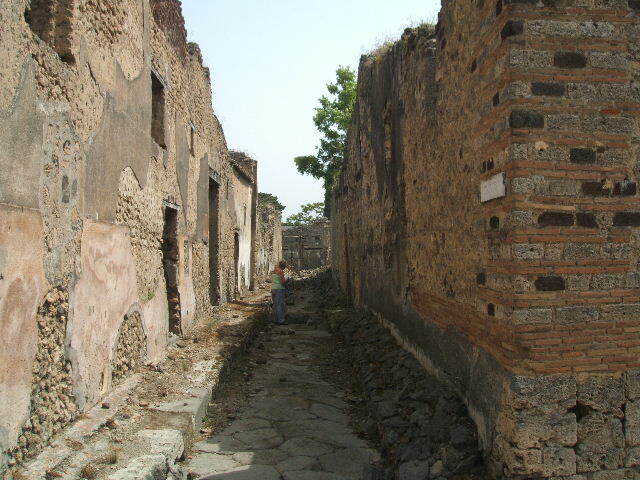 IX.6.5 Pompeii. May 2005. North side of peristyle garden area 3, looking east. Note there are no longer any columns on the east side (see below). The low wall that joined them survives (see picture at IX.6.7). IX.6.5 Pompeii. North side of peristyle garden area 3, looking east. Note the columns still standing, in the distance on the east side. IX.6.5 Pompeii. May 2005. Cistern mouth in north-west corner of peristyle 3, looking south. IX.6.5 Pompeii. May 2005. Peristyle garden area, looking south-east. In the south-east corner, behind the green plants and column, would have been rooms “s”, “t” and “u”. According to Jashemski, the portico around the peristyle was supported on four sides by 16 columns. They were painted black below, and white with reddish cast above. 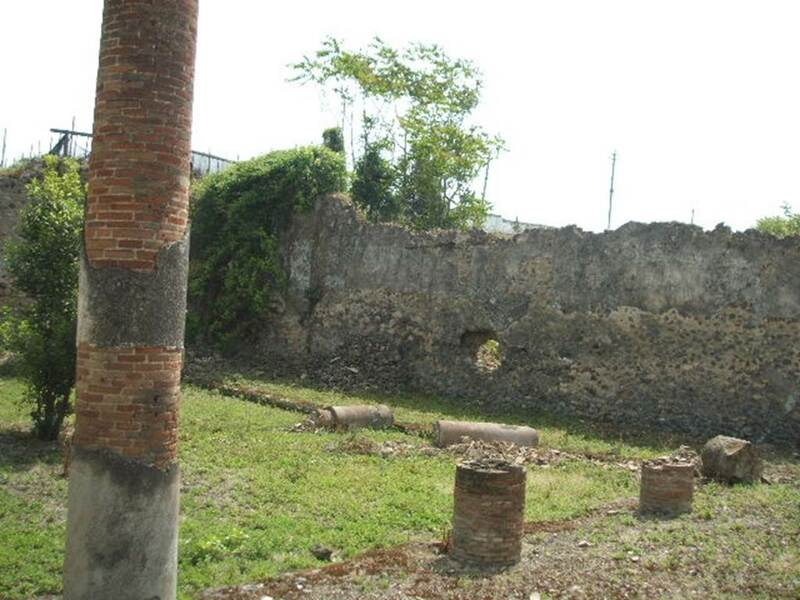 The columns on the east side were joined by a low wall. IX.6.5 Pompeii. May 2005. Peristyle garden area 3, looking south-west. 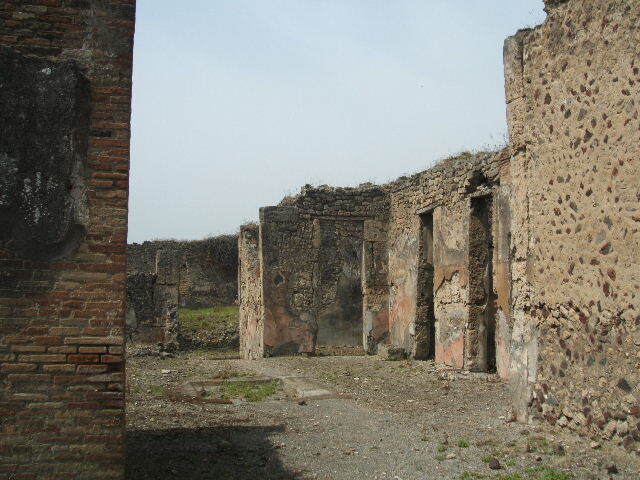 IX.6.5 Pompeii. May 2005. Column in peristyle, looking west along south side. On the right of the photo, the doorway into IX.6.4 can be seen. A marble cup was found in peristyle on 13/11/1878. Now in Naples Archaeological Museum. Inventory number 111384. See Marmora Pompeiana nel Museo Archeologico Nazionale di Napoli: Studi della SAP 26, p. 177. IX.6.5 Pompeii. May 2005. 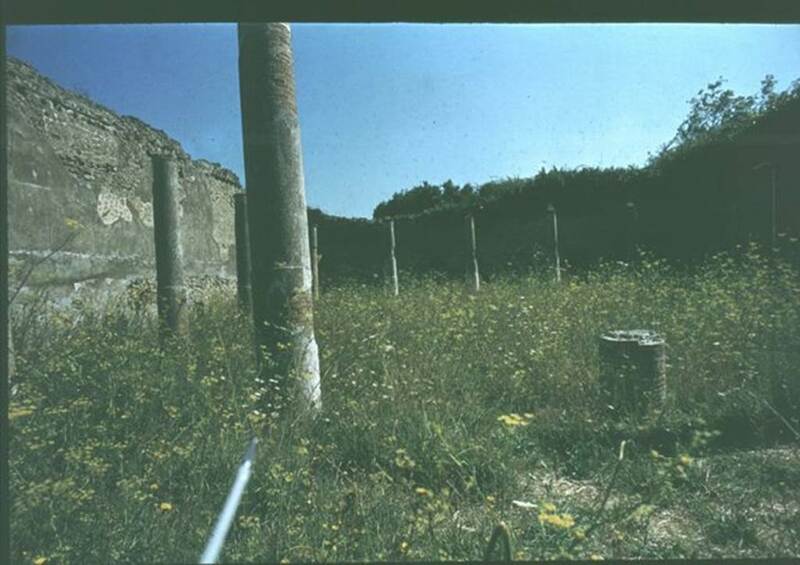 Room “h”, oecus/triclinium in south-west corner of peristyle. 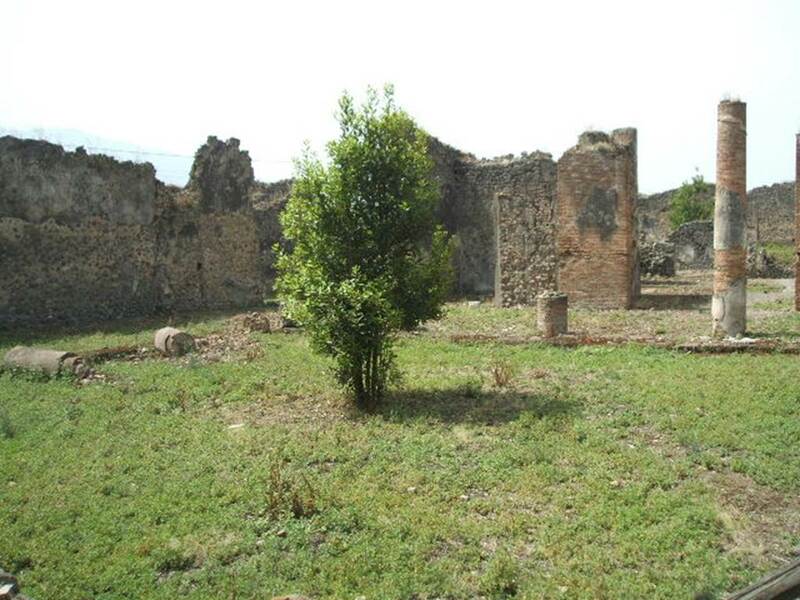 According to Mau, the decoration on the walls of this room was in III style, but it had been largely destroyed when discovered. It was done on a white background (other than a black zoccolo), simple but not without pretty concepts; there were no paintings. The entrance doorway of “h”, originally 3,95m wide, was later made narrower. 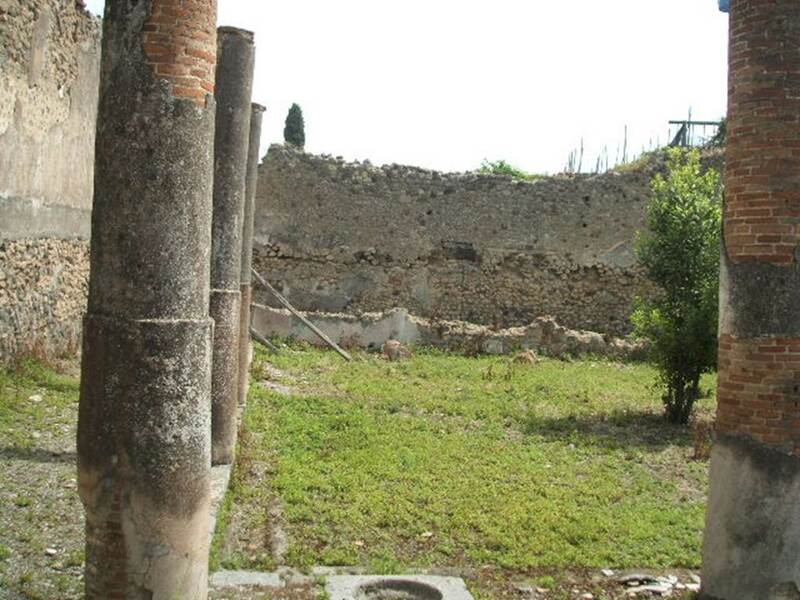 Eschebach identified the exedra (or oecus or triclinium) onto the garden, as being on the right hand side (south) of the tablinum. According to Della Corte, found in the triclinium against the skeleton of a fugitive, were silver and bronze coins, a golden ring and three statues of Penates, together with nine bronze bracelets. According to Boyce, in the south-east corner of the south portico of the peristyle were found numerous objects. Two Lares, each with patera and rhyton. He gave the reference as Notizie degli Scavi di Antichità, 1878, 372. According to Notizie degli Scavi di Antichità, 1878, pp.372-3, on 11th November, a skeleton was found on the right of the peristyle, with money and a silver ring. On 22nd November, in the south-east corner of the peristyle, a ring, money and other objects, including a bronze statuette of Mercury and two statuettes of the Lars, were found. See Guzzo, P., 2003. Tales from an eruption. Milano, Electa, pp.113-115. Octagonal bronze inkpot, Inventory number 115614. Bronze bracelets with big green glass paste stone as fastening, Inventory number 118270-71. Bronze statuettes of Lares, Inventory numbers 115555-56. 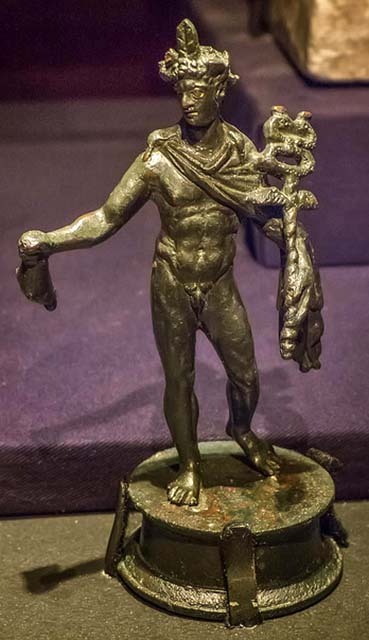 Bronze statuette of Mercury, with petasus, caduceus and bag, Inventory number 115554. IX.6.5 Pompeii. May 2005. South-east corner of the south portico of the peristyle. Looking north-west from tablinum “g” across atrium towards entrance corridor, doorways to rooms “a”, “b” and “c”. Looking south in room “i”, originally this was the south ala but then converted by adding a staircase to the upper floor. 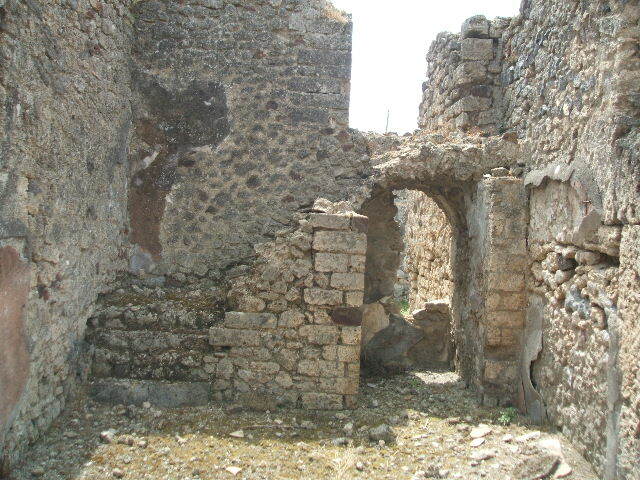 The stairs would have led to the rooms on the upper floor of the adjoining house at IX.6.4. A passageway, one time existing towards the room “y” was blocked up and plastered in red, as was the rest of the ala.
IX.6.5 Pompeii. May 2005. South-west corner of room “k” on south side of atrium. According to Mau, rooms “k” and “l” (room L) preserve remains of decoration in the first style: the remains of the walls in “k” are white, in “L” they were rough and unplastered. 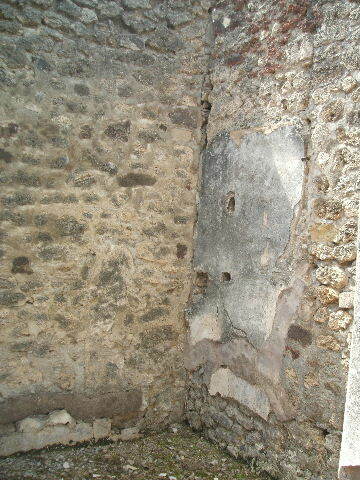 In the west wall of “k” one could see the holes for supporting two shelves in the remains of the white plaster. The door threshold of lava had four rectangular hollows for the fixtures of the door, and one square hollow for the door-bolt/latch. 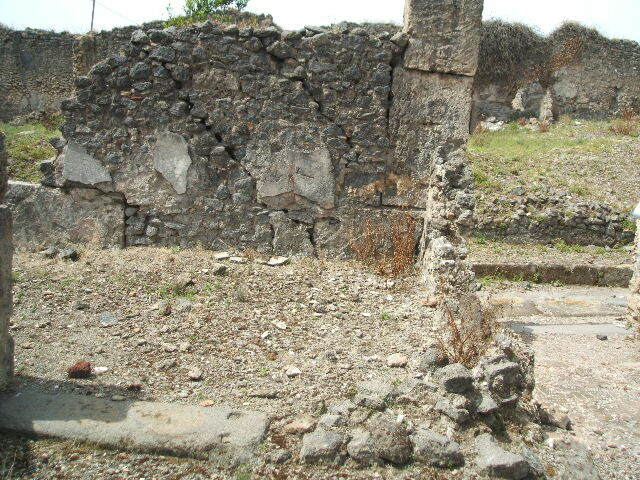 IX.6.5 Pompeii. May 2005. Looking south in room “l” (L) on south side of atrium. 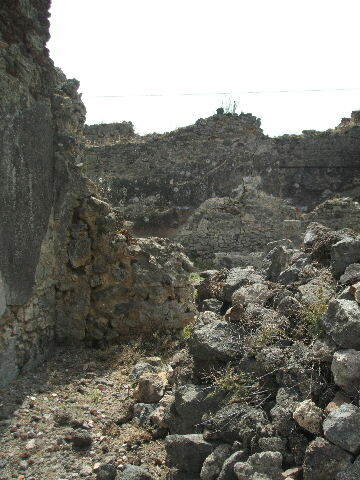 Over the ruined wall, the house at IX.6.4 can be seen. The pile of stones may be the remains of a staircase to the upper floor. According to Mau, from room “L” one entered the stairs that leaned against the wall of “m” leading to the upper floor, whilst the stairs in “i”, as we have seen, communicated only with the upper rooms of IX.6.4, both not excavated. IX.6.5 Pompeii. May 2005. Looking west to remains of doorway with threshold/sill to room “m”, a triclinium. 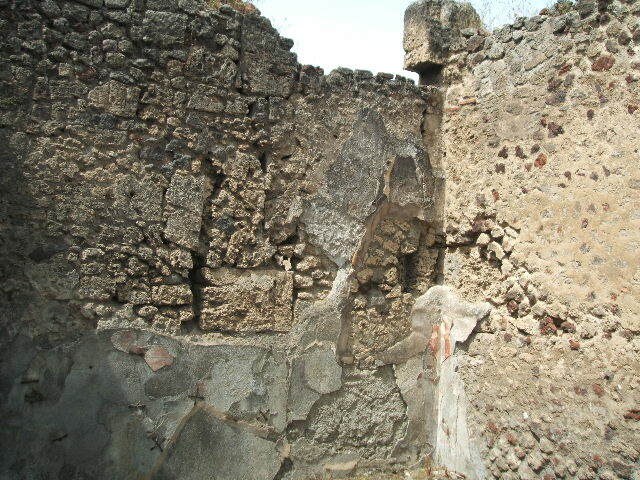 On the right of the photo are the remains of the north wall of room “m” dividing it from the entrance corridor to the house. According to Mau, “and so not least to room "m", which had a rough decoration on a white background, divided into compartments by red stripes. Room "m" had two rectangular windows onto the western vicolo, which at least in their current form were after the First Style decoration visible on the outside of that wall”. 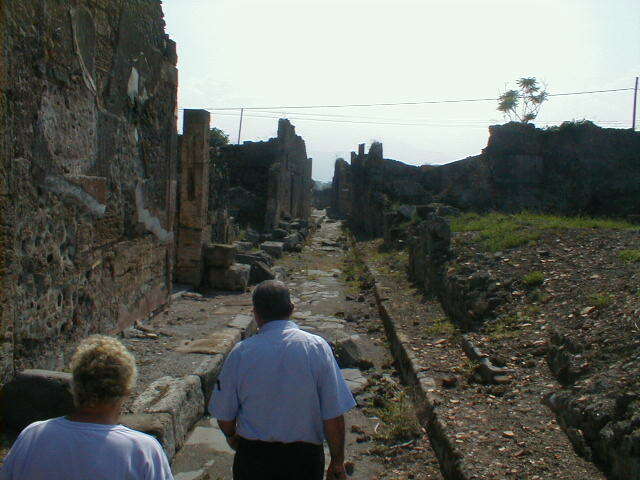 IX.6.5 Pompeii, on left. May 2005. Vicolo di Tesmo, looking south. IX.3 on right. IX.6.5 Pompeii. May 2005. Vicolo di Tesmo, looking south. The exterior west wall of IX.6.5 can be seen on the left. The remains of the exterior wall of IX.6.4 can be seen in the centre of the photo. IX.3 can be seen on the right. IX.5.19/18, on left. May 2005. Unnamed vicolo, looking east along north side of IX.6.5, on right.